Spending time with pets is the best. Whether it’s playing with a cat, taking our dogs on walks, or anything in between, we love getting the chance to unwind with our furriest friends. One of the best things of all is having your dog or cat come snuggle with you after a long day of work. Yet this beloved pastime can be slightly less beloved if your pet is slightly less clean. Matted, smelly fur or long and scratchy nails are not exactly ideal, for you or for your pet. For this reason, we know that pet grooming is incredibly important, but it goes far past wanting a cute and cuddly ball of fluff to hang out with. Pet grooming is essential for your dog or cat’s health, and Royal Pets Market & Resort is pleased to offer these services at our Palm Harbor, Carrollwood, and St. Petersburg locations. 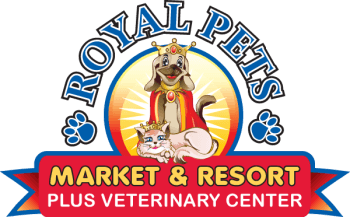 For dog toys, pet boarding, veterinary clinics and more, Royal Pets Market & Resort is the perfect place for your perfect four-legged friend. 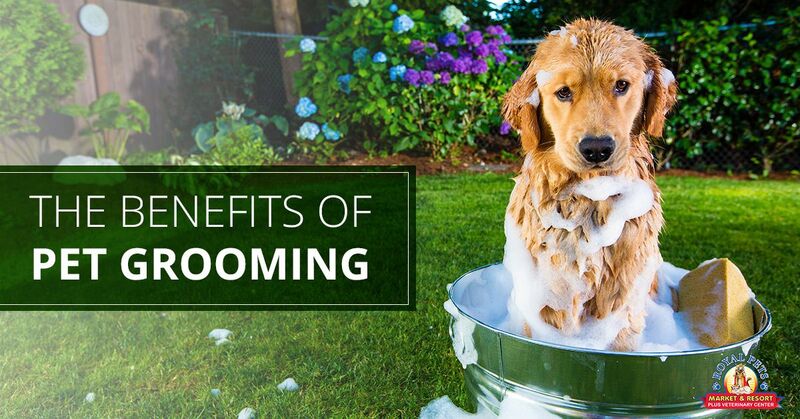 Learn about the benefits of pet grooming, and visit one of our locations today! How does grooming impact pet health? Through regular brushing, you as a pet owner are also able to check for anything that’s out of the ordinary. Ticks and fleas are important to watch for, as they can affect an animal’s physical health and wellness. Brushing and caring for your pet’s coat also means you can spot any skin abnormalities, such as rashes, dry spots, unusual lumps, or more. While there are animal diseases or maladies that aren’t noticeable through grooming alone, a healthy coat can serve as an indicator for a healthy dog for any of the aforementioned issues. look at why it’s better to take your dog or cat to the pet grooming experts at Royal Pets Market & Resort. Pet groomers are trained and highly skilled in their job. While some of us may have trained our dogs or cats to be the perfect little angel during any and all grooming activity, there’s a good chance that your pet might not like you coming at them with a nail clippers or a bottle of pet shampoo. Pet groomers are trained to clip nails correctly, to brush and cut hair/fur, to notice irregularities, and they can work very well with animals. These are all things that need to be consistently checked upon, and require training and skill set needed to ensure the job is done correctly. For example, if nail clipping is not performed regularly and precisely, long nails can grow into the skin and paws, which can lead to infection (not to mention pain and discomfort). This is particularly true for indoor dogs and cats. Working with a specialist in pet grooming means that you can rest assured knowing that your dog or cat is being cared for. Whereas a pet owner might see their fluffy husky panting in summer and start to panic at the thought of their amazing dog suffering from overheating, pet groomers know better. Pet groomers understand that each animal has a specific coat that is specific to their breed, and they know how to best work with your pet, regardless of the hair or fur type. With the previously mentioned example, pet groomers and veterinarians alike understand that an animal’s hair type is meant to function as a temperature regulator, and very infrequently requires shaving. It’s completely normal and more than OK if you aren’t an expert on animal fur and hair, because we have the experts at Royal Pets Market & Resort! Bring your pet into one of our many locations to get the grooming services they deserve. Pet groomers have the proper materials and equipment. Picture the process that goes into us getting a haircut or hair trim. Although some people with shorter hair might be just fine going to a friend or family member with a hair clipper, anyone with longer hair knows the importance of going to an expert. Not only are hair salons equipped with the skills and know-how of cutting hair accurately (and well), they have the means to do so. The same can be said for pet groomers. Those who specialize in pet grooming have access to the equipment and tools needed to do a great job. Just like you don’t want your hair to be choppy or uneven, you don’t want that for your pooch (and we’re pretty sure they don’t want that either). Schedule an appointment with Royal Pets Market & Resort today to get your pets beautified in a way that not only benefits their overall appearance, but their health as well. The benefits to taking your dog or cat to a pet groomer practically speak for themselves. It’s so important to help your pet stay healthy and happy—a happy pet makes for a happy pet owner as well! We know pet grooming is a critical part of a pet’s life; take a look at when pet grooming should start and how often it should occur. When should my pet see a groomer? For longer-haired dogs, such as an Afghan hound or certain terriers and collies, a trip to the groomer should happen every four weeks. Dogs with medium-length coats, like poodles or Shih Tzus, can wait every six weeks to see a groomer. In some instances, waiting longer than this amount of time is not only tougher and less healthy for the dog, but it can also lead to a higher price for grooming. If the fur is too matted, shaving is likely the inevitable option, which isn’t the first choice for groomers (but sometimes has to be done). Cats are notorious self-groomers, and don’t need to see a groomer nearly as frequently. However, they still require brushing a few times a week (for longer coats, every day), and if you notice their nails getting long, it’s definitely a good time to schedule an appointment with the pet groomer. While cats can seem somewhat finicky when it comes to nail clipping and grooming, starting them out young is your best bet for making consistent pet grooming a habit instead of a horror. When it’s time to get your dog or cat in for a pet grooming, trust the experts at Royal Pets Market & Resort. Serving St. Petersburg, Palm Harbor, and Carrollwood, you don’t have to travel far to get your pet the care they deserve. Our veterinarians and pet groomers are here for you—stop in one of our stores or call for an appointment today!